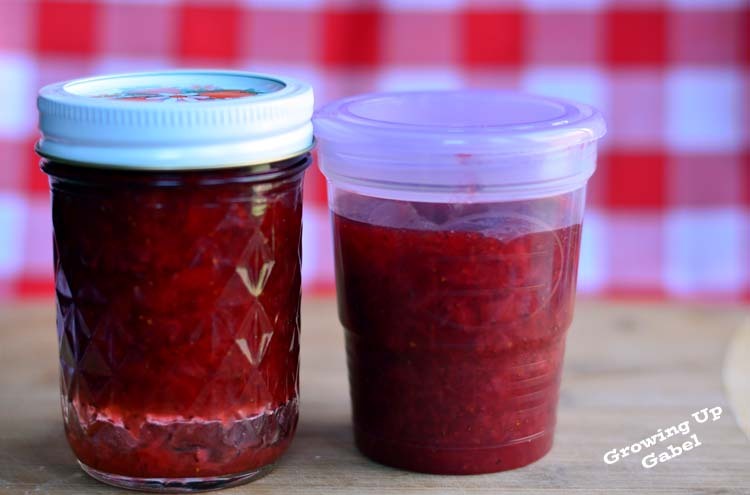 Strawberry jam is a great way to preserve summer berries to enjoy later in the year. 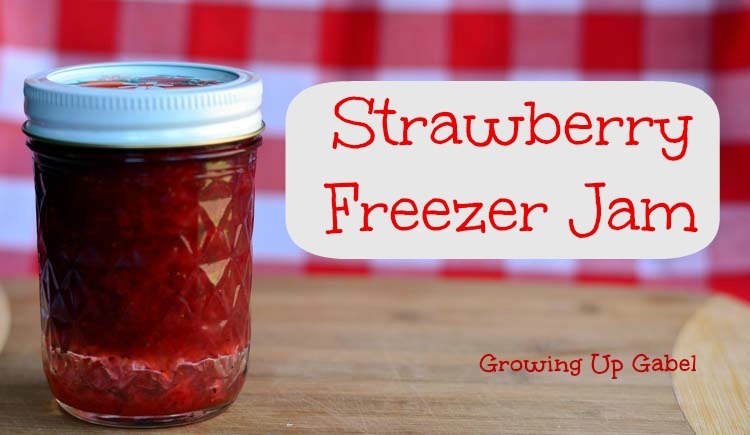 Strawberry freezer jam I super simple to make, too! This recipe only requires fruit, pectin, sugar and about 20 minutes to make a delicious strawberry jam to store in your freezer. Freezer strawberry jam was one of my mom's signature recipes. I had no idea any other jelly or jam existed when I was a kid because all we had was mom's strawberry freezer jam. This week's Sunday Supper theme is Summer Berries so it's the perfect time to share my favorite jam recipe. It's very important to make sure you get the right pectin. 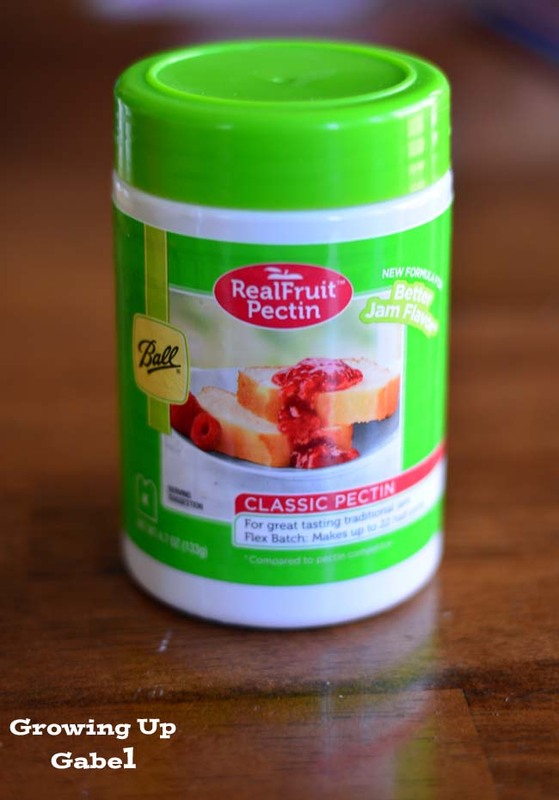 You want classic pectin – the kind that requires you to cook the jam. I've tried the no cook, instant pectin and it just doesn't work as well. The resulting jam doesn't set as firmly as the cooked kind. I use two different kinds of jars for freezer jam. The traditional half-pint canning jars work great and I love them because they are so pretty! But if you are leery of freezing glass, you can sometimes find plastic jars made specifically for the freezer. I haven't seen them around this season, though, so you may need to search a little. They work great for freezing homemade chicken stock or homemade cream of mushroom soup, too. Put strawberries in a large bowl and mash with a potato masher. You will need 1 1/3 cups total mashed strawberries. In a medium sauce pan (larger if making a larger batch), stir together strawberries and pectin. Stirring constantly, bring mixture to a full rolling boil that can't be stirred down. Add sugar and stir to dissolve. Bring mixture to a full boil again and then allow to boil, while stirring, for 1 minute. Remove from heat. Ladle jam in to desired containers and allow to cool for 30 minutes. Refrigerate and use immediately or freeze for later. Make sure to check out the other amazing berry recipes in this week's #SundaySupper! Yummy ! simple & easy.Perfect for me to try. Looks good ! I totally need to start making my own preserves, love this! No canning? I can do this! I am going to have to send this recipe my mom’s way because she loves doing freezer jam but had lost her recipe and just couldn’t get it to come out right doing it from memory. This sounds really good! I might try making my own jam this summer. I’m visiting you today from Keeping It Simple. I co-host a Linky Party Tuesday (open thru Sat) and I’d love for you to link up! I hope you get a chance to stop by, link up and leave a comment, too! Just love a freezer jam. Summer in a jar. The plastic jars are a great idea! And I’m so glad you shared your mother’s recipe with us. It sounds amazing. How great to make jam without having to do all those canning steps. How great it can be frozen and enjoyed after the berry season. Nicely done!! That looks so very good. I have to try freezer jam for sure!! Wow – I love how easy and simple this is – I have to try it out myself! I never thought to freeze jam! What a great idea. Thanks for sharing! I love this idea, thank you. I need to make this. I’m always canning jam but it would be nice to make some freezer jam as well. Thank you for sharing your recipe for the strawberry freezer jam. It sounds delicious! I love all these jam recipes! I don’t know why I’ve never made jam before–I’m definitely going to give this one a try! This is the kind of jam I remember my grandma making. There’s nothing better to me than a big dallop of strawberry jam on a cookie or slice of toast. Camille, what a great jam, and nice reminder of your childhood! I appreciate your tips on the pectin and the glass, saving this newbie to jam-making from future problems! I have had glass explode in the freezer (totally my fault for filling it up to high! ), love those plastic jars. I will have to be on the lookout. All of these jam recipes are really inspiring me to try making my own! Strawberry Shortcake ~ Summery Berries #SundaySupper!